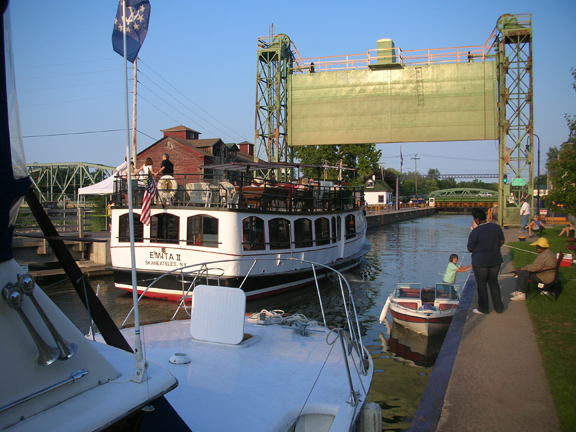 of docking with electric, water, restrooms all on the south wall of the canal just west of Lock 24. 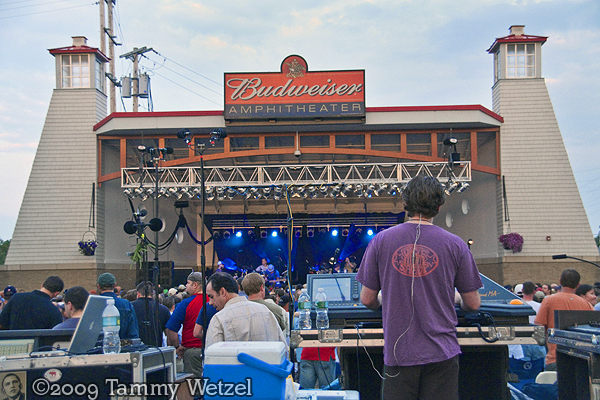 There are a variety of restaurants and services within proximity to the Canal. Centuries before American history was recorded, the Seneca River transported early peoples into this region. Here they mined its rich fishing grounds. The shallows just east of today’s Paper Mill Point provided a ready fording place for those traveling north or south. For “through travelers” the river was a vital link in a waterway system that connected the Atlantic Ocean with the Mississippi River. was unsettled wilderness. In 1790 the Towns of Lysander and Van Buren were designated as part of the Military Tract, lands which were given to veterans in appreciation of their military service. In 1794 a bateau landed on the south shore of the river just west of the shallow rifts, and John and Lydia McHarrie disembarked. Leaving their farm in Maryland, they came to the frontier where they became Baldwinsville´s first permanent settlers. McHarrie turned to the river for his own livelihood as he helped the growing number of travelers, explorers and settlers portage the Seneca at these shallows. Among those travelers were Dr. Jonas Baldwin and his wife Eliza who came through in 1798. Captivated by the area´s natural beauty, the Baldwins returned in 1808 and commenced development of the community which would take their name. By the end of 1809, Dr. Baldwin had put the essential infrastructure into place. He erected a dam to harness the river´s energy and constructed a private canal to protect the integrity of the water highway. He also built a bridge to preserve the area´s position as a north-south access point. The rural settlement rapidly expanded to become a diversified industrialized mill town surrounded by a variety of retail and service businesses. The community´s activities and accomplishments have covered a wide spectrum. B´Villians have answered every national call to arms since the War of 1812. 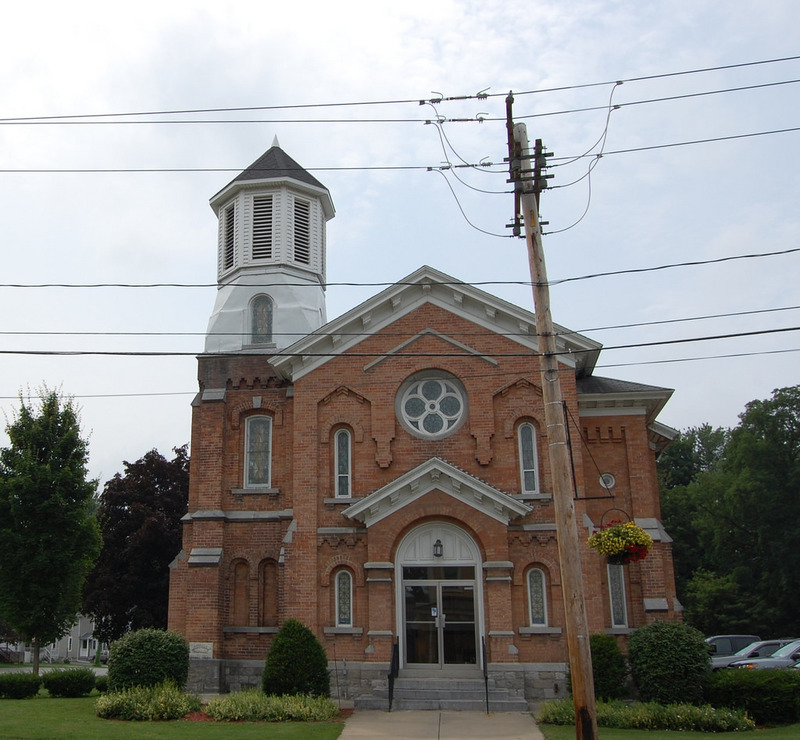 The village´s Grace Episcopal Church was the first church in the nation to be illuminated by electricity. The internationally famous Morris Machine Works, a century long leader in the development and production of centrifugal pumps, was established and operated here. Notable agricultural activities included tobacco cultivation as well as commercial peony, iris and aster farms. 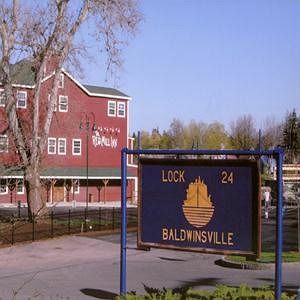 Connected to the railway network in 1848, Baldwinsville´s interests extended far beyond town boundaries. A“pettiloon” clad woman was seen here in 1851. Elizabeth Street resident John Humphrey was a conductor on the Underground Railroad. Three B´Villians became mayors of Syracuse. Today a rich architectural legacy resides in the community´s many surviving 19th century buildings. Ranging from vernacular designs to high style, they include the works of prominent architects Horatio Nelson White, Archimedes Russell, Charles Colton and Ward Wellington Ward. Honored by National Register status and acclaimed by national publications, these structures and their histories provide a unique resource for the new century. 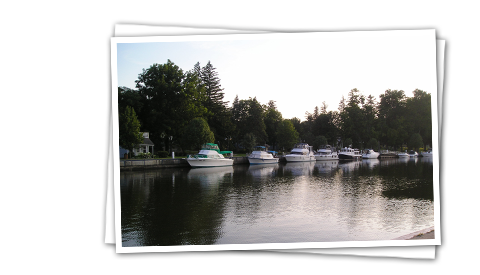 Throughout the years the Seneca River has remained as the community´s heart. Improved dams, bridges, raceways, construction of the Barge Canal, boat clubs, water festivals and today´s conversion of yesterday´s industrial island to a new recreational facility in the midst of the scenic Seneca keep the spotlight on this vital resource.